04 Jan 2017 / 11:29 H.
NOT many may know that the Biji-biji Initiative’s very first big project was one related to fashion. Considering that the social enterprise is known for championing sustainable living, and the fashion trade’s notoriety as the world’s second largest polluter, it may seem pretty ironic. But here’s the catch: the 2,000 bags Biji-biji was commissioned to make were crafted out of unwanted advertising banners, and with a community in need. The banner bag became an iconic wearable by the group, that they have since incorporated materials such as carpets (felt) and seat belts to make totes, purses, clutches and bucket bags. Co-founder Zoe Victoria said the group buys rejected seat belt stocks and gets its supply of banners and felt from several corporations after their events. Biji-biji also makes it a point to collaborate with independent groups and traditional artisans. “As a social enterprise we are committed to certain principles of ethical and fair production so we always try to source locally and work with small groups of people. We prefer that than going to a commercial centre which could offer cheaper rates but it’d create less social impact,” said Victoria. To exemplify, Biji-biji is hoping to support the demand for Malaysian batik by working with craftsmen in Terengganu for the inner linings of the bags. Additionally, each piece of batik is credited to its maker. “Batik used to be a booming trade but it has declined so much now. We have witnessed the working conditions and struggles of the cottage industries in the east coast. “If anyone were to wear batik these days, it’s most likely to be from Indonesia – it’s much cheaper because a lot more people are doing it,” divulged co-founder Azam Hisham. Last year, Biji-biji Initiative made the bold decision to form a fully fledged fashion label out of their upcycled creations. For the year ahead, Biji-biji Design (www. bijibijidesign.com) aspires to cement its foray into the local fashion scene without compromising the environmental and ethical principles Biji-biji Initiative were founded upon. To show that they mean business, Biji-biji Design roped in shoes, womenswear and menswear designer Maatin Shakir six months ago to enhance the bag designs. Sure enough, Maatin’s monochrome design made the Magnolia seat belt beach tote a bestseller. “I find inspiration from walking around in KL, how the public wears their bags, because there are so many occasions people use them for. Some people use clutches exclusively for events, but there are some who carry it for everyday use,” the Sarawakian designer highlighted. 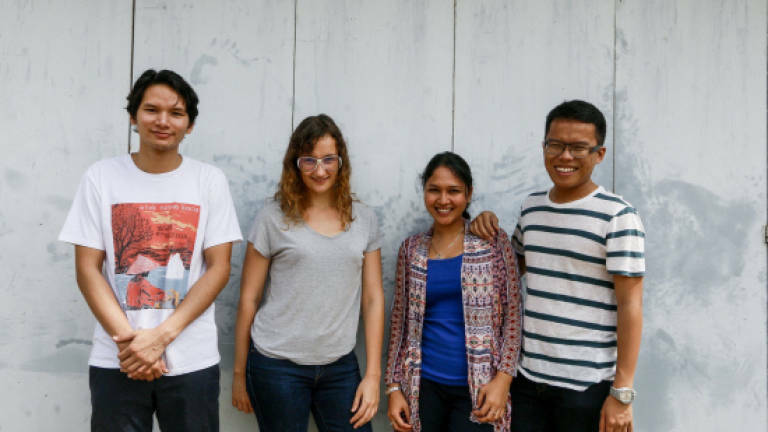 Even though Biji-biji Design’s bags are made out of at least 45% locally acquired recycled materials, it is virtually impossible for any fashion label in Malaysia to be 100% sustainable. Azam lamented the inevitable process of importing certain parts and accessories – such as metal rings – from China to fulfil the functionality of the product. Back to the bigger picture, Azam reiterated that Biji-biji aims to be an equal player in the fashion scene before eventually generating the dynamics of and conversation surrounding sustainable fashion. Consumers don’t shop sustainability, after all – they prioritise trends and value for money. Last but not least, Azam implores consumers to ponder upon the damaging effects of fast fashion. The truth – that inexpensive, mass-market clothes are produced by labourers in poor working conditions for unreasonable hours and unfair wages – can be a bitter pill to swallow. “Secondly, people don’t think about how long mass-produced clothing lasts. A pair of pants from a global retailer probably can last you a month – that itself is unsustainable. “And because we don’t have sustainable brands here, it’s always good to buy something that has good craftsmanship and is sourced from a small, local business because that usually means a lot of work has been put into the product,” he concluded.